Baby toys can be so much fun to shop for. They’re so cute, colorful and fun! But, now that I’m on my second baby, I don’t just go for cute factor, I want to make sure that the toys I bring into my home are safe, eco-friendly, and have an obviously thoughtful design. 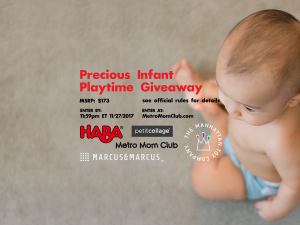 So, as part of my series on surviving a second baby with style, I am giving away the best toys for your newborn in this precious infant playtime giveaway to get some high-quality coos from mom and baby. The My First Touch & See Alphabet book from Petite Collage is an adorable book for exploring the alphabet a la Montessori with touch textures. 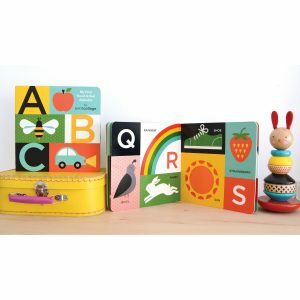 With Petit Collage’s awesome original, signature illustrations, adults will also love flipping through this as baby’s first ABC book. 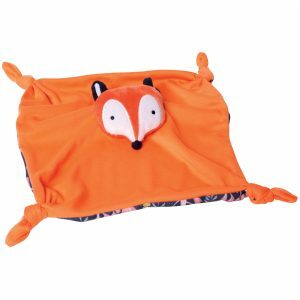 The Camp Acorn Fox Blankie is an adorable blanket from Manhattan Toy Company. Who doesn’t love a little woodland friend? The soft texture makes for great snuggling at night, and the knotted corners at each end work perfectly for teething babies! Of course, never leave a newborn alone with any kind of blanket nearby until they can safely roll themselves over. But, this will surely become the tattered and decomposing best-friend that they still sleep with in 1st grade. 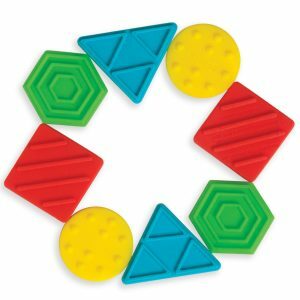 Speaking of teething, Texture Shapes teething toy is a great toy for teething infants and babies. 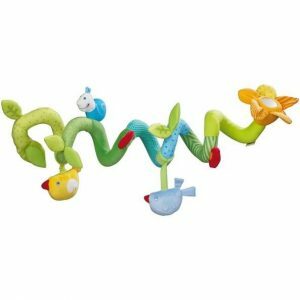 This colorful, easy to grasp toy is non-toxic and is strung on a strong nylon cord. Your baby will enjoy all the different shapes, textures and bright colors in his or her hand and mouth! I love this cute and silly Mold Free Bath Toy squirting bath toy from Marcus & Marcus. 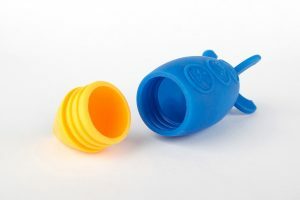 It is super soft silicone, easy for babies to hold (and has no sharp edges), and is mold free! Most squirt toys for the tub get full of black algae in no time but the detachable parts make it a breeze to keep this bath toy clean. Just throw it in the dishwasher for a deep clean or open it up after bath and leave it on the tub edge to air dry. It’s big, too, like 6 inches long so it’s easy for even teeny tiny hands to grasp. 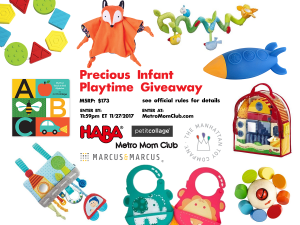 Marcus & Marcus is known for having beautiful, bright colored toys and gear that keep your little one engaged in meeting their milestones. 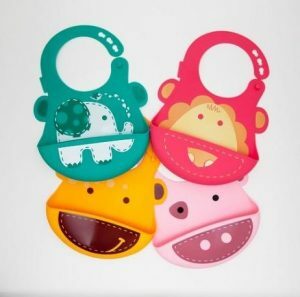 These animal themed baby bibs are made from food-grade silicone and are BPA-free, PVC-free and phthalate-free. They are easy to clean, you can just stick them on the top rack of the dishwasher! My favorite part is the built-in crumb catcher, making clean up a lot easier and dinner time less messier once food is introduced. Win one of these awesome bibs with your choice of character Marcus the Lion (Red), Pokey the Pig (Pink), Lola the Giraffe (Yellow), Ollie the Elephant (Green). All of Marcus & Marcus Products can be purchased on Amazon. 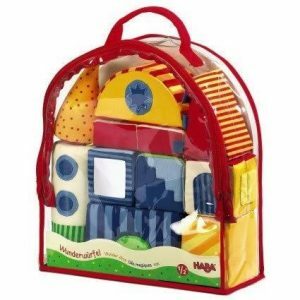 HABA is a European toy company known for quality, simplicity and integrity when it comes to baby toys and toys for kids of all ages. The Meadow Friends Activity Spiral is the perfect accessory for the baby’s crib, stroller or car seat! With all the different colors, fabrics, actions, animals and mirror foil, it makes for a fabulous learning and exploration tool that will entertain your baby. 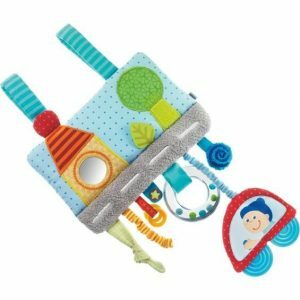 The Play Wrap Happy Trails is another awesome toy from HABA that can be attached to cribs and car seats, play gyms and strollers. 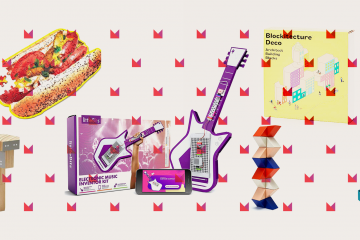 With different sounds and textures, this colorful play wrap is easy to set up and can provide fun entertainment for your little one. My baby is obsessed with this toy. We strap it to the toy bar on his bouncy chair and he goes to town for 15 minutes at a time. With all the toxic materials that can be found in today’s toys, I love when I can find a good wooden toy. 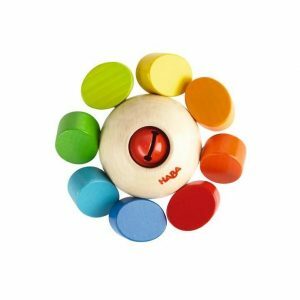 The Whirlygig from HABA has movable, colorful knobs and a bell in the middle that jingles. It’s a simple toy that helps with clutching and grasping for your baby and you can feel fine about it constantly being put in his or her mouth…as it inevitably will. The Wonder Dice Fabric Blocks are great for baby’s imagination. The fabric textured blocks come in different shapes, sizes, colors, textures, sounds and mirror foils that will certainly fascinate your little munchkin. 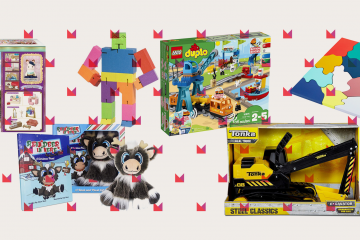 From crinkly sounds to jingles to squeaks. From soft velvet to pull tabs to ridged vinyl. Babies will love playing with these easy to grasp, easy to stack, colorful blocks. Now that you know the details, Enter here and good luck! !